Published annually, this book brings together original and first-rate articles written by leading scholars in the field of philosophy. James E. Tomberlin is Professor of Philosophy at California State University, Northridge, where he has taught since completing graduate study at Wayne State University in 1969. He has published more than seventy essays and reviews in action theory, deontic logic, metaphysics, philosophy of language, mind, religion, and the theory of knowledge. Besides editorship of the present series, he has edited Agent, Language and the Structure of the World (Hackett, 1983), Hector-Neri Casteneda, Profiles (D. Reidel, 1986) and he co-edited Alvin Plantinga, Profiles (D. Reidel, 1985). Part I: The Sixth Philosophical Perspectives Lecture: . Computer Proof, Apriori Knowledge, and Other Monds: Tyler Burge. Part II: Intensionality and Intentionality: . Teh Subject Verb Object Class I: Joseph Almog. The Subject Verb Object Class II: Joseph Almog. Why Holism is Harmless and Necessary: Akeel Bilgrami. Actions, Norms, and Practical Reasoning: Robert Brandom. Semantics for Opaque Contexts: Kirk Ludwig and Greg Ray. Proportionality and Mental Causation: A Fit? : Matthew McGrath. 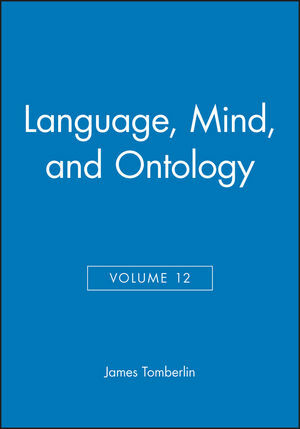 Part III: Language, Ontology and Truth:. Identity and General Similarity: Harry Deutsch. Reference and Description Revisited: Frank Jackkson. Some Reflections on the Sport of Language: Mark Norris Lance. Three Norms of Assertibility, or How the MOA Became Extinct: Huw Price. Rules and Powers: C. B. Martin and John Neil. Facts, Truth Conditions, and the Skeptical Solution to the Rule-Following Paradox. Part V: The Nature of the Mental. . Numbers, Minds, and Bodies: A Fresh Look at Mind-Body Dualism: John O'Leary-Hawthorne and Jeffrey K. McDonough. Mind the Gap: David Papineau. The Boadness of the Mental: Some logical Considerations: Timothy Williamson. Part VI: Consciousness and Qualia: A Symposium: . The Division of Phenomenal Labor: A Problem for Representational Theories of Consciousness. A Narrow Representationalist Account of Qualitative Experience: Georges Rey. Inverted Earth, Swampman, and Representationism: Michael Tye. In Defense of the Representational Theory of Qualia (Replies to Neander, Rey, and Tye): William G. Lycan. Part VII: Naturalism and Actualism: An Exchange: . Naturalism, Actualism, and Ontology: James E. Tomberlin. Putting Metaphysics First: A Response to James Tomberlin. Actualism, Quantification, and Contextual Semantics: Terence Horgan.